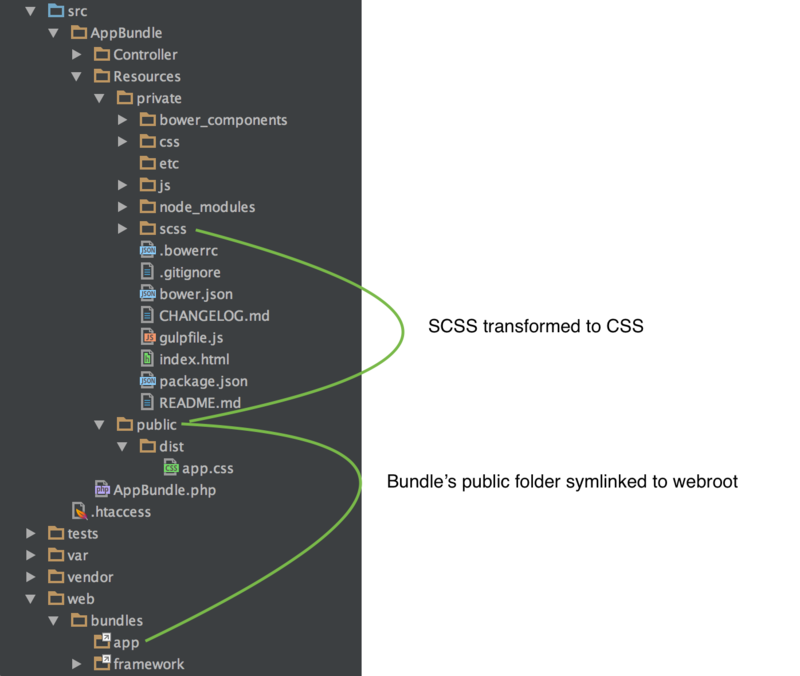 All files placed in the Resources/public -directory within a bundle is made available to the web server using a Symfony Command for assets install. Since Symfony 2.6 it has featured symlinking to the real asset directories, making the requirement to run the command limited to the times you add new bundles. The Foundation front end framework from ZURB is one example of which uses Gulp as a build system by default. A good workflow for front end development will use the recommended practises from the framework, rather than crafting your own. This is analogous to working with the Symfony Framework for reusing your skillset across projects and technologies. The whole directory is linked, so you need to run the command only when you enable new bundles. Changes to resources will be directly reflected to the browsers. Note that a cache server like Varnish or a CDN can cache the data if your file names stay as is. This approach is very generic and can work with a number of other tools, whether you're working with Bootstrap, React or Angular 2 in your project, leaving the front end implementation workflow completely up to the developer. Moving a static prototype to a Symfony app is drop-dead simple. So for simple cases this workflow (with some .gitignore additions) has worked very well for me. If you end up having more complex needs, with front end assets coming from multiple different bundles and so on... you'll want to look into other tools like Puli, which is complementary technology for working with assets.